The NHL has released their three stars for last week, and Sergei Bobrovsky has taken the top spot after an incredible stretch. The goaltender went 4-0 and stopped 115 of 117 shots to push the Columbus Blue Jackets back into a playoff spot. While there is plenty of speculation over Bobrovsky’s future, he’s obviously committed to helping the Blue Jackets this season. The 30-year old goaltender will become an unrestricted free agent on July 1st. Darcy Kuemper has been awarded the third star after he continued his excellent season in Arizona, but it’s Tyler Bertuzzi who may raise some eyebrows in the second spot. The Detroit Red Wings forward had ten points in four games last week and now has 44 on the season including an impressive 19 goals. Though the team may not have found much success in the standings this year, it’s been an incredible development year for players like Bertuzzi, Anthony Mantha and Andreas Athanasiou. With CHL and college seasons coming to an end several junior players will be heading to the AHL. Semyon Der-Arguchintsev is one of those players, assigned to the Toronto Marlies while the team has also signed Alex Basso, Zachary Bouthillier and Erik Brown to amateur tryouts. Der-Arguchintsev was the Maple Leafs`third-round pick in 2018 and had 46 points in 62 games for the Peterborough Petes this season. Other CHL players joining their AHL teams are Vladislav Kotkov (San Jose Barracuda) and Matthew Strome (Lehigh Valley Phantoms). The Montreal Canadiens welcomed back an important player today when Paul Byron made his return to practice. The speedy forward had missed two games after fighting MacKenzie Weegar but could make his return in an extremely important game against the Tampa Bay Lightning tomorrow. The Canadiens are sitting one point behind Carolina for the final wild card spot and may need to win out to qualify for the playoffs. It was a busy day for the always-informative Aaron Portzline of The Athletic, reacting to the news that intriguing prospect Alexandre Texier was on his way to North America to join the AHL’s Cleveland Monsters and begin his Columbus Blue Jackets career. However, Portzline didn’t stop there, as he had news on a couple more top prospects in the Columbus pipeline. The most pressing report comes out of Switzerland, where Portzline notes star goalie Elvis Merzlikins and his NLA club, HC Lugano, are down 3-0 in their first-round series against EV Zug and on the brink of elimination. Game Four will take place on Saturday and, should that be the end Lugano’s season, it could begin the anticipated move for Merzlikins across the Atlantic. While Merzlikins has struggled against the higher-seeded playoff opponent, it won’t erase the merits of yet another strong regular season for the 24-year-old keeper, who logged a .921 save percentage for the second straight year and a his best goals against average as a starter at 2.44. Merzlikins has developed nicely in Switzerland, but it is time for the promising Latvian netminder to move on. With Sergei Bobrovsky moving on from Columbus as a free agent this summer, Merzlikins and Joonas Korpisalo are currently the only candidates to take over as starter barring an addition to the roster this off-season. Either way, the exciting young goalie will almost certainly make his NHL debut in 2019-20. Portzline expects Merzlikins to finish the season in North America, but that likely means joining Texier on the Monsters, not supplanting any of the three goalies currently on the Blue Jackets roster. Another top Blue Jackets prospect is not as likely to make the jump to North America this season. Portzline writes that up-and-coming Swedish forward Emil Bemstrom looks unlikely to finish the year with Columbus or an affiliate due to other commitments. Bemstrom’s team in the Swedish Hockey League, Djurgardens IF, are the four seed in the upcoming postseason. The team is likely to be competitive in the first round, if not advance beyond that stage. If and when they are knocked out, Portzline states the Blue Jackets do not expect him to immediately join them. Instead, Portzline believes he could be a candidate to play for Sweden’s entry into the World Championships this spring. A fourth-round pick just two year’s ago, Bemstrom’s rise to top prospect status has been meteoric and has been capped off with an SHL season this year in which he is second in scoring for Djurgardens with 35 points in 47 games at just 19 years old. From relative obscurity, Bemstrom has emerged as arguably the best drafted prospect in Sweden this year and could help Columbus out as early as next season. Just don’t expect the jump in the coming weeks. Arguably the biggest name on both the trade market and the upcoming free agent market is Artemi Panarin, who has been represented by Dan Milstein and Gold Star Hockey. No more, as according to Kevin Weekes of NHL Network, Panarin has changed agents. Elliotte Friedman of Sportsnet tweets that Panarin will now be represented by Paul Theofanous, who also works with teammate (and fellow pending free agent) Sergei Bobrovsky. Speculation is bound to immediately erupt over this news, with the idea of Panarin and Bobrovsky being a free agent package the obvious conclusion. That’s not necessarily true even if it does seem more likely, as the number of teams who could afford to add both would limit the market. It also doesn’t increase the odds that Panarin re-signs in Columbus, something that seemed extremely unlikely after comments from Milstein last month. Panarin will remain the top rental option at the deadline, and the decision on whether he will be moved still comes down to the Blue Jackets front office and GM Jarmo Kekalainen. The 27-year old forward does not have any trade protection in his current contract and can be moved without his approval. Columbus has won two games in a row however and may decide to keep both Russian free agents through the end of the season to try and win a Stanley Cup. We have informed the team that we are willing to discuss Artemi’s future after the season. Our priority now is to focus on the rest of the season, trying to win a Stanley Cup for the Columbus Blue Jackets and their fans. Milstein added that there will be no further comment from the player’s side on negotiations this season, as they have made the definitive call to leave contract talks for the off-season. Panarin is well within his rights to want to solely focus on his game and the Blue Jackets’ stretch run this season and previous comments have made it clear that he does enjoy playing for Columbus and is determined to help the team succeed in the postseason. However, it may be difficult for him to accomplish that if he is traded to a different team. That is the risk that he has taken and the choice the team must evaluate over the next month leading up to the NHL Trade Deadline. 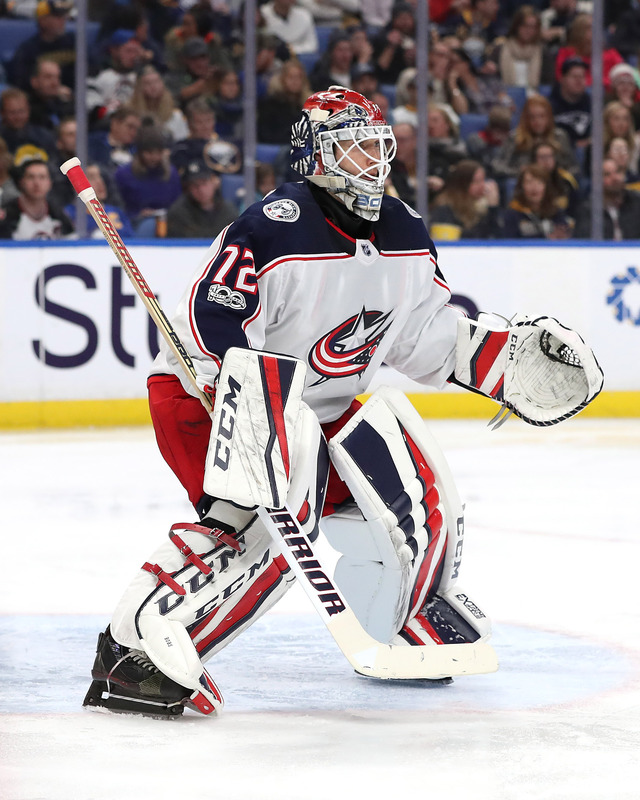 Although the Blue Jackets look to be playoff-bound again, the idea of both Panarin and goaltender Sergei Bobrovsky walking in free agency and leaving Columbus with nothing to show for it is daunting for GM Jarmo Kekalainen and company. Kekalainen declined to comment on Panarin’s announcement this evening, but is likely to speak about the topic soon. It would not be a surprise to see the Blue Jackets at least listen to offers for Panarin, but they face a tough decision of whether to sell off their top scorer and virtually sabotage their own title hopes or potentially lose him in the off-season. For what it’s worth, Panarin’s statement tonight nor any of his previous remarks ever expressed that he was unwilling to re-sign in Columbus. He reportedly has been happy during his time with the team and has exceeded his production from his Chicago Blackhawks days. Panarin set a career high with 82 points last season and is currently on pace for 95 points this season. Panarin has previously stated that he enjoys playing with several of his teammates, namely young center Pierre-Luc Dubois, and feels that Columbus is built to last. Despite rumors that he is focused on larger, coastal cities, the Blue Jackets are a young, talented team that has just as good a chance of signing Panarin this summer as anyone. Columbus also has the cap space moving forward to meet the market demands for Panarin, the enormity of which could rule out many other suitors. Panarin’s stance of not negotiating in-season should still leave weeks for exclusive negotiation following Columbus’ postseason exit as well, that is unless he succeeds in his goal of leading the team to the Stanley Cup final. Panarin, PHR’s No. 2-ranked free agent, will be a hot commodity if he hits the open market and the Blue Jackets know that they would hardly be the only team in pursuit. The question now is whether they think they can re-sign him after the season or whether they want to try to win without him during the season. Today’s announcement certainly doesn’t help the odds that Panarin remains with Columbus, but until a decision is actually made by one side or the other, he remains in the Blue Jackets’ plans this year and beyond. The Columbus Blue Jackets have quietly put together an excellent season. The team found themselves heading into tonight’s action just two points behind the Washington Capitals for first place in the Metropolitan Division and could have all the pieces in place for a Stanley Cup run. Unfortunately though, two of those important pieces are scheduled to become unrestricted free agents at the end of the season, keeping them in the rumor mill even though the team must dread parting with either. Those two are Artemi Panarin and Sergei Bobrovsky, of which the latter was recently involved in an incident that earned him the equivalent of a one-game suspension from the team. According to Aaron Portzline of The Athletic (subscription required), Bobrovsky immediately undressed and showered after getting pulled from a game earlier this month, instead of remaining available to go back in if required. That incident, though only keeping Bobrovsky away from the team for a single day, prompted many fans and media members alike to question his future in Columbus. They weren’t the only ones to question the veteran goaltender’s future with the Blue Jackets, as according to Portzline’s colleague Pierre LeBrun, Bobrovsky himself apparently indicated to the team that he is willing to waive his no-movement clause for the right trade destination—and he indicated that months ago. As LeBrun notes, it does not sound like the Blue Jackets have asked him to waive it or presented him with any possible destination, and it’s easy to understand why. The two-time Vezina winner is a huge part of the Blue Jackets hopes this season even if he hasn’t performed up to his lofty standards to this point. Going into the playoffs as a Stanley Cup contender with Joonas Korpisalo as your starter is a tough place to be in, meaning that Columbus would need to replace Bobrovsky with someone else. At that point, unless you’re getting someone with term and upside, there’s not going to be a better rental option than keeping your in-house goaltender. With just under six weeks until the NHL trade deadline, a deal for Bobrovsky still seems unlikely—even to our readership. Prime goaltenders rarely bring back their true value in-season given that contenders are usually in that position because of their strength between the pipes. Even so, we now know that the goaltender is willing to waive his clause if necessary, and that will only generate more interest if an elite goaltender goes down in the next month. Poll: Where Will Sergei Bobrovsky Finish The Season? It seems every day there is a new name dominating the headlines around the NHL as we approach the February 25th trade deadline, and today that name is Sergei Bobrovsky. The veteran goaltender will not dress for the Columbus Blue Jackets tonight after an incident took place which “failed to meet expectations and values” of the club. Though a spokesperson for the team originally said the goaltender was expected back at practice on Friday night, Aaron Portzline of The Athletic (subscription required) did a bit more digging and found out that GM Jarmo Kekalainen will have a meeting with Bobrovsky first to determine the next step. 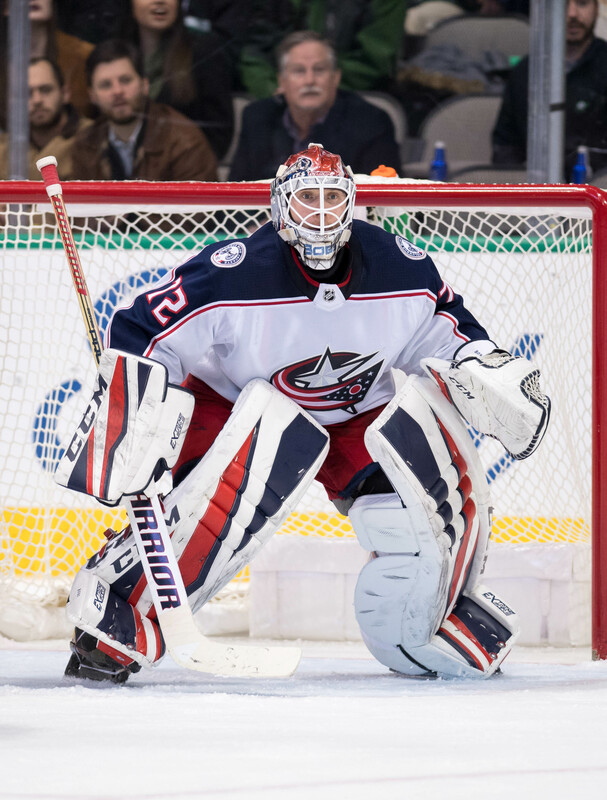 No matter how that meeting goes, there is a bigger question than when Bobrovsky will return to practice—will he be with the team at the end of the season? The 30-year old goaltender will become an unrestricted free agent after the 2018-19 season if he and the Blue Jackets don’t come to an extension, something that seemed extremely unlikely even before this latest incident. Now the team must decide whether they even want to keep him past the trade deadline and put him out there for a playoff run, or cash in to get whatever assets they can from a contender looking for an upgrade in net. It’s clear that even if Bobrovsky is mired in one of the worst seasons of his career that he would still be an upgrade for many potential contenders. The two-time Vezina Trophy winner hasn’t completely lost his game and is still at an age where goaltenders can usually find success. Even his .906 save percentage is still better than names like Martin Jones, Philipp Grubauer, Jake Allen, Cam Talbot and Mike Smith, all expected to be front line starters at the beginning of the season for their respective clubs. There’s little doubt there would be some interest if Bobrovsky was made available. The problem is that it’s not necessarily even Kekalainen’s decision. When we asked a similar question yesterday regarding pending UFA forward Wayne Simmonds, less than seven percent of votes believed he would finish the year with Philadelphia. After all, Simmonds has limited no-trade protection (names 12 teams he will not go to) and a struggling team. But Bobrovsky is a different situation not only because of the strength of the Blue Jackets, but also the full no-movement clause he holds. If he doesn’t want to go to another team there is no way the team could force it, meaning he also would have a big say in where he ended up. So where will his season end? Does Bobrovsky get another chance to lead the Blue Jackets back to the playoffs, a place where he has traditionally struggled? 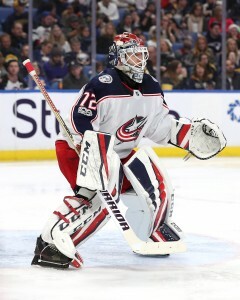 Or will a contending team blame the rest of the Columbus organization for failing to win a single playoff series and acquire the veteran goaltender to take that next step in a different uniform? Cast your vote below and explain your reasoning in the comments.